No celebrities were on my flight to Nice, and I’m trying not to take that as a bad omen. Last May I watched Naomi Watts sheepishly walk into a bathroom near the boarding door before takeoff and emerge wearing cashmere sleeping wear and scalloped pink Chloe flats as slippers. In 2015, Charlize Theron slipped on last minute in sunglasses and her hair in a loose ponytail. She carried her young son and bee-lined it to first class. My theory is that if I’m going to head to the fanciest film festival in the world, I’d like the fancy to begin while the overbooked red-eye Delta Boeing 767 is still stuck in a gate in JFK’s Terminal 4. 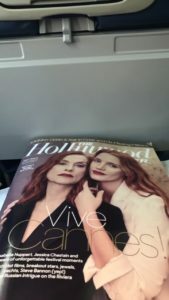 Plus, I’m convinced nothing catastrophic will happen over the Atlantic if big-time actresses are reclining in flat beds at the front of the plane like pampered guardian angels. This year I was on my own. The closest I got to the upper echelon was reading The Hollywood Reporter. Oh well. I still landed safely along the sun-kissed Mediterranean. So let’s explore the terrain! Glamour aside, I’m obsessed with the French press protocol at Cannes. Rest assured the caste system is alive and well along the Promenade de la Croisettte. Every accredited press member is assigned a color-coded badge upon check-in that essentially determines your festival experience. This doesn’t exist at, say, the Toronto International Film Festival. (Love ya, Canada!) 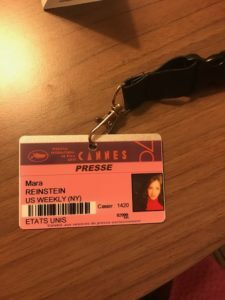 The VIPs —i.e., world-renowned and veteran critics and journalists — are assigned a white laminate, enabling them to stroll right in to any press conference or screening. Next comes a pink badge with a yellow dot. Consider them a very respectful A-minus/B-plus. New York magazine. The L.A. Times. The middle class = pink. There will be a line but it can be overcome. No cause for panic. At the bottom of the rung? Blue and yellow. These are primarily reporters and Internet bloggers. They can’t get into press conferences. Journalists and officials dismiss the blues and yellows the way audiences dismissed King Arthur. I couldn’t sleep on the plane because I was so nervous I’d be downgraded to a blue. Just sit me in a middle seat in the back next to the bathroom, why don’t you!!!!! I got pink. Phew. And yet, every time I walk by a journalist with a white badge I consider pulling a Jeff Gillooly. Day one is a little slow except for the press conference of the jury members. This year’s panel is a mix of acclaimed foreign directors (Pedro Almodovar, Maren Ade) and big-time Hollywood actors (Jessica Chastain, Will Smith). The room was at capacity a full 30 minutes before the start time. Mais oui! This is a prime opportunity to breathe the same oxygen as the talent. Try to find the former Fresh Prince in this photo. Want to know the difference between an actor and a movie star? I present to you Chastain and Smith. The former owned the room from the second he walked in and inquired where he should sit on the dais. “I’ll be playing the part of Will Smith!” he bellowed, before joking “I’m working on my juror face” and playfully telling the snapping photogs, “Security! Security!” This was all before the first question. Chastain, meanwhile, sat quietly and politely — dare I say meekly? — and later spoke of her art in a peculiar Euro-affected accent. Smith oozes magnetism. Nobody else at the table had a prayer. Smith, for his part, sensed he didn’t quite belong with the art-house set. “I was born in West Philly,” he explained (duh, we know the theme song! ), “and Cannes was the ultimate prestige in cinema. I’m excited to be here and I’m excited to learn. I’m actually here very selfishly.” After a general question about viewing certain films through a female lens, he chimed in, “I’ll be looking at films with an African-American eye!” Cue laughter. He also got provocative, disagreeing with Almodovar, the jury president, over the inclusion of Netflix films in the prestigious competition. 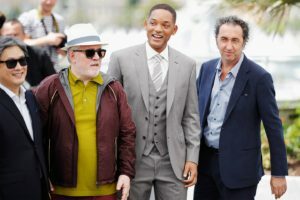 After the iconic Spanish director tersely admonished the site (as well as the process of viewing movies on a small screen), Smith interjected a few minutes later and defended it. “Netflix has no effect on what my kids watch at a movie theater,” he noted. But while giving his two cents, he failed to note that he recently made a $90 million Netflix movie. But what’s Cannes without some controversial fun under the sun? Besides, all the jurors, as well as Julianne Moore, Susan Sarandon, Naomie Harris, Uma Thurman, Elle Fanning and Robin Wright happily walked the famous red carpet tonight for the invitation-only opening ceremony. See? The glamour touched down in the south of France after all. Maybe the NYC-based Thurman, Sarandon and Moore were on my flight and I didn’t see them. Either way, I’m excited to soak it all in. Though right now I’m psyched to soak in this cheeseless margarita pizza and Orangina. Don’t judge. It’s a pink badge thing.